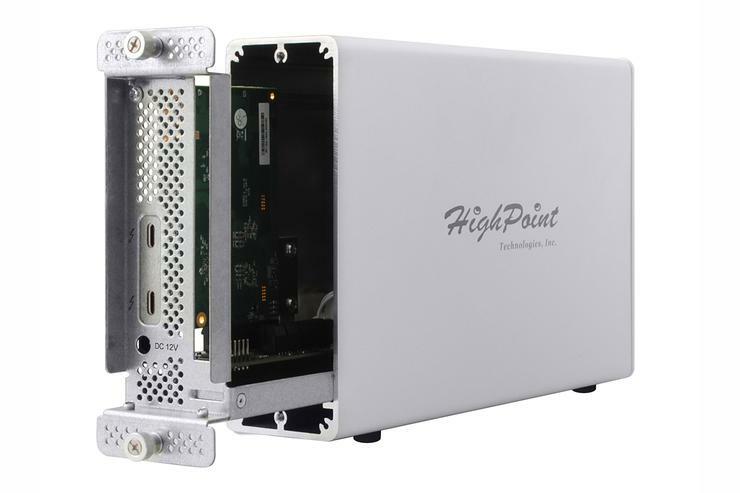 HighPoint’s RocketStor 6661A PCIe/NVMe external storage enclosure may be a mouthful of a moniker, but it’s a top-notch performer and extremely easy to set up. At $189 on Amazon, it’s more basic, but also more affordable than the direct competition—Akitio’s Node Lite (currently $220 on Amazon)Remove non-product link. The Rocketstor 6661A features sturdy all-metal construction, including the slip-off cover secured by captive thumbscrews. 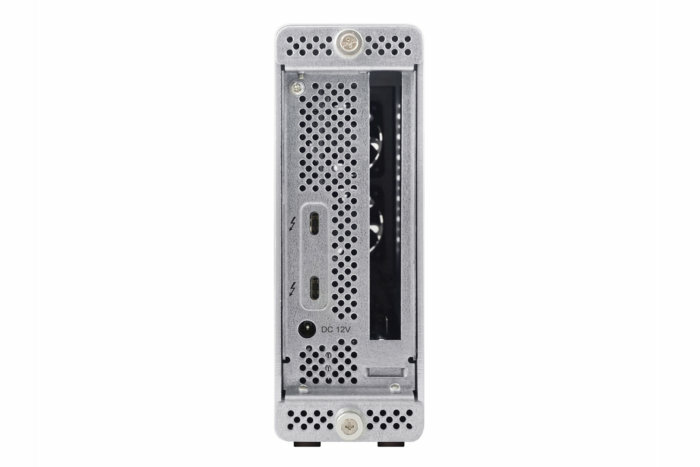 Not intended for eGPU (external graphics) use, it’s just wide enough for normal-size PCIe cards to fit in its single x16 (sixteen PCIe lanes) slot. The slot is just like those you’ll find in a desktop PC, and as with a PC, cards are held in place with a screw through the upper part of their end bracket. Though not particularly eye-catching, the 6661A’s design is highly efficient and rugged. The 6661A isn’t really anything special to look at, but it’s beautiful in function. Matte aluminum-colored, with an array of perforations to circulate air drawn in by the twin small fans—it’s on point in terms of thermals. 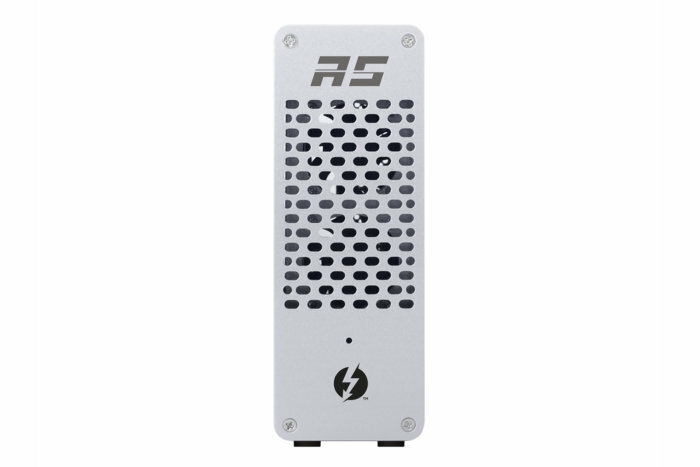 On the back are two Thunderbolt 3 ports and the AC power jack. There’s no dedicated DisplayPort port as on the Akitio Node Lite, but you may, of course, use the second T3 port to drive a display via an adapter. 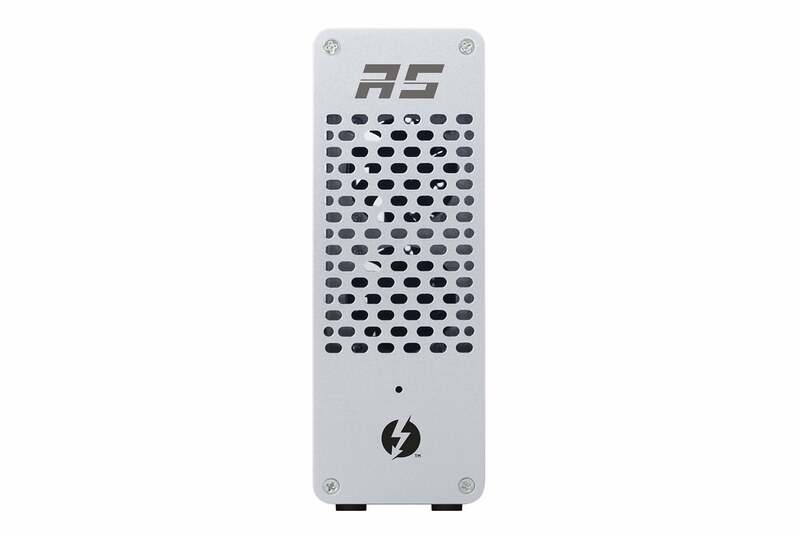 Two Thunderbolt 3 ports and the AC jack are all that adorns the back of the 6661A. While there’s no on/off switch, the 6661A will turn itself on and off as it senses power on the Thunderbolt 3 bus. I tested the Rocketstor 6661A using a 960GB Intel 905P x4 PCIe/NVMe SSD, the same drive used in the Akitio Node Lite with Optane. Also included here are the numbers with the 905P mounted internally in our test bed. 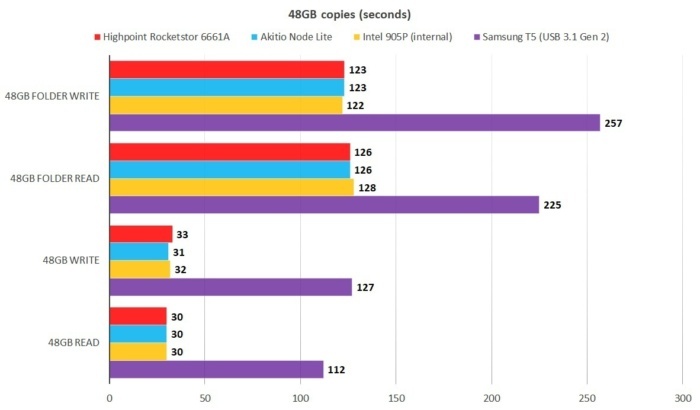 Samsung’s T5 is shown to illustrate the speed difference between non-RAID Thunderbolt 3/NVMe drives and USB 3.1 Gen 2/SATA drives. 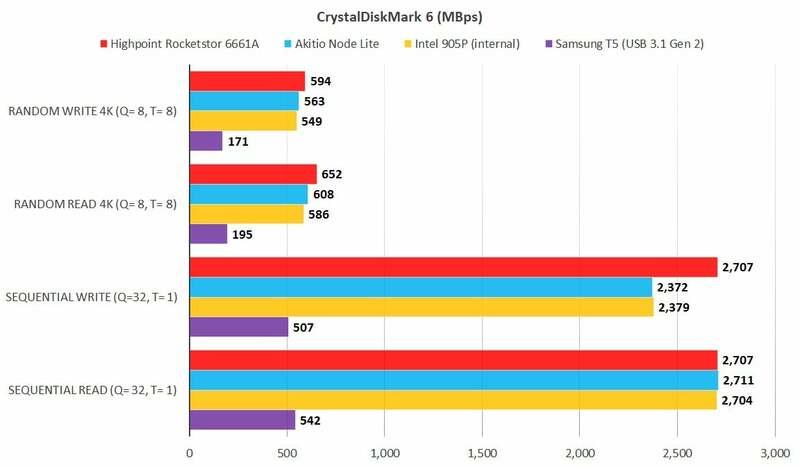 CrystalDiskMark showed some difference between Highpoint’s 6661A (red bars) and Akitio’s Node Lite, but they were generally quite small and well within the margin of error. The long and short of it is, there’s no performance difference between the Akitio and HighPoint worth basing a buying decision on. In some tests, the 6661A was slightly faster than the Node Lite, and in others it was slightly slower. These discrepancies are imperceivable subjectively, and well within the margin of error for the tests. There’s not a lot to choose from performance-wise between the 6661A (red bars) and the Node Lite. Seek times are fantastic with both. The 905P was slightly faster mounted inside our testbed, but Thunderbolt 3 again proved it’s nearly as fast as internal PCIe. Sorry USB Forum, USB 3.1 Gen 2 is a great interface for many things, but it’s not as fast as PCIe over a wire. No matter what the test, the 6661A and the Node Lite were just about dead even in performance. The 6661A doesn’t support graphics cards, so its x16 slot is actually overkill even if you use something such as Highpoint’s 7101A NVMe M.2 4-slot RAID card. The two are available together as the 6661A-NVMe (it should be called the 6661A-RAID) for $550, but Thunderbolt only offers 4 PCIe lanes, and that card showed little real-world performance benefit with common software. I can’t recommend it for anything other than increasing capacity. It’s a rather pricey option for that alone. On a 2017 Macbook Pro, Disk Speed gave the 6661A a very nice score. That said, we’ve seen better write scores with other drives inside. 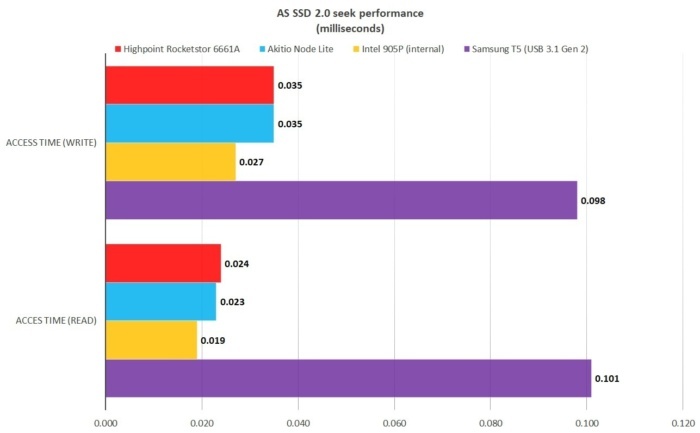 Intel’s 905P was used in this test; you might fare better in terms of raw throughput with Samsung’s 970 Pro or EVO inside. As all modern Macs have Thunderbolt 3 ports, we also ran the RocketStor 6661A on a 2017 MacBook Pro, shown above. We’re not sure why the write numbers were relatively slow, but it was the same case with the Akitio Node Lite. 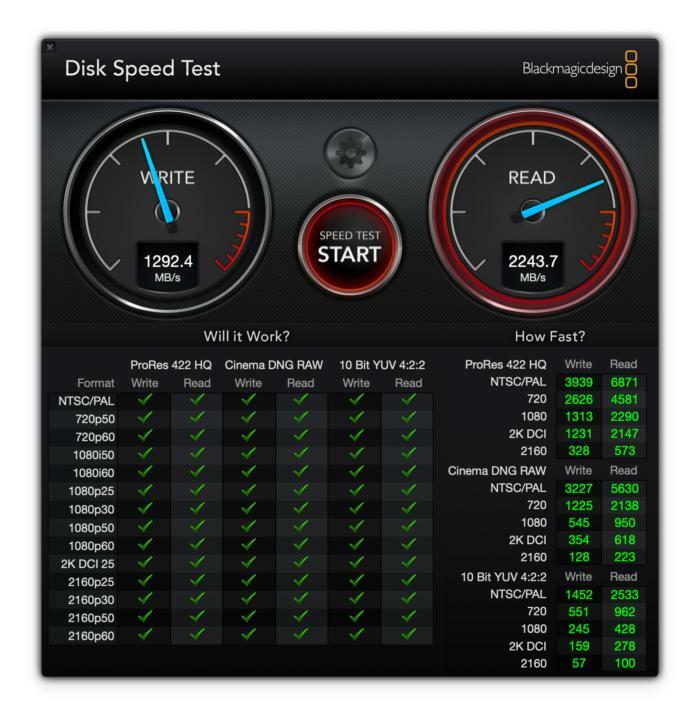 We’ve seen much better performance using other drives in the same enclosures on modern Macs. Note that you don’t need to use a drive as expensive as the 905P, worthy as it is. Samsung’s 970 Pro (available via Amazon and reviewed here) and 970 EVO (available on Amazon and reviewed here), as well as WD’s Black NVMe (available on Amazon and reviewed here) are all viable, as well as far less expensive alternatives. They will provide the same kind of throughput, albeit slightly slower seeks and performance with smaller files. See the article on NVMe over Thunderbolt in Macworld for more information. There’s a lot to like about the Rocketstor 6661A. It isn’t quite as stylish as Akitio’s Node Lite, and lacks that box’s DisplayPort port, but it offers the same storage performance, and does so for a lower price. More (or better) for less will always garner the buying recommendation. The RocketStor 6661A is recommended. Note: I’ve seen complaints online about the 6661A’s suitability for other purposes such as 10Gb ethernet cards. The 6661A is sold as an NVMe enclosure, and for that, it’s top-notch.